As an industry leader in leather chamois and sea sponge production, Acme Sponge and Chamois Co remains committed to helping ensure healthy and sustainable fisheries, consumer protections and to giving back to the community. Toward those ends, our officers are active in organizations such as Florida Sea Grant, The National Institute of Weights and Measures and the Sponge and Chamois Institute. 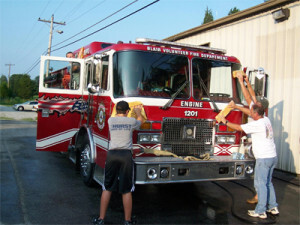 In addition we support our nation’s first responders by providing some of those in need with Sponges and Chamois to help keep critical equipment clean and maintained. We support educational programs related to aquaculture and are involved with our local Tarpon Springs community. Acme company officers are also involved on the board of directors of Florida Sea Grant and the Florida Oceans Alliance, groups dedicated to both research and information dissemination with the goal of having sustainable natural resources and healthy oceans that can be used by all constituent users from tourism to commercial fishing, sport fishing and boating interests. Acme has also worked closely with the National Institute of Weights and Measures (NIST), to provide information to insure that proper standards are in place for correctly measuring and marking product retail packaging and help ensure consumer protections. In addition to our other efforts, we are committed to serving those who serve us by offering some of our first responders the tools they need to keep their equipment properly maintained and clean. Firefighting is a dirty business, and we’re proud to be able to help with the cleanup by donating sponges and chamois to some of our country’s finest. Acme is also committed to working with educational organizations to educate and inform about aquaculture and sea sponges in particular. We are currently in the process of developing classroom materials that meet national curriculum standards to help teachers and students learn more about the wonder of sea sponges and their uses.